Do discontinuation rates influence therapy? Tumor necrosis factor (TNF) antagonists are biologic response modifiers that have significantly improved functional outcomes in patients with rheumatoid arthritis (RA). RA is a progressive disease in which structural joint damage can continue to develop even in the face of symptomatic relief. Before the introduction of biologic agents, the management of RA involved the use of disease-modifying antirheumatic drugs (DMARDs) early in the course of disease. This focus on early treatment, combined with the availability of the anti-TNF agents, has contributed to a shift in treatment paradigms favoring the early and timely use of DMARDs with biologic therapies. Improvement in symptom control does not always equate to a reduction in disease progression or disability. With the emergence of structure-related outcome measures as the primary means for assessing the effectiveness of antirheumatic agents, the regular use of X-rays is recommended for the continued monitoring and evaluation of patients. In addition to the control of symptoms and improvement in physical function, a reduction in erosions and joint-space narrowing should be considered among the goals of therapy, leading to a better quality of life. Adherence to therapy is an important element in optimizing outcomes. Durability of therapy with anti-TNF agents as reported from clinical trials can also be achieved in the clinical setting. Concomitant methotrexate therapy might be important in maintaining TNF antagonist therapy in the long term. Overall, the TNF antagonists have led to improvements in clinical and radiographic outcomes in patients with RA, especially those who have failed to show a complete response to methotrexate. Rheumatoid arthritis (RA) is a chronic, systemic, inflammatory disease that affects approximately 1% of the world's population. It is characterized by a loss in functional capacity resulting from decreased structural integrity of the joints, diminished muscle strength and tone, and a variety of psychosocial factors. A 10-year outcomes study of 183 patients with early RA showed that most (94%) are able to manage daily life activities. On the basis of disability scores on the Health Assessment Questionnaire (HAQ), a self-reported measure of functional impairment, 20% of patients had no disability, 28% were mildly disabled, and 10% were seriously disabled . Treatment strategies have traditionally involved the use of disease-modifying antirheumatic agents (DMARDs) and, more recently, the tumor necrosis factor (TNF) antagonists. To optimize the functional outcomes of patients with RA, it is essential to examine the role of these newer agents in preventing disease progression and, potentially, in producing a cure. This examination requires several considerations, including (1) the importance of treating patients early, (2) the fact that improvements in symptom control do not necessarily signal reduced disease progression and disability, (3) the emergence of structure-related parameters as a primary means of assessing response to therapy, (4) therapeutic alternatives for patients who do not respond satisfactorily to one anti-TNF agent, and (5) discontinuation rates and whether they influence therapy, given the desire for durable clinical responses. One nonrandomized, comparative study of pre-biologic therapies (namely standard DMARDs) compared the effects of delayed and early treatment on disease outcome in 206 patients with probable or definite recent-onset RA as defined by the 1958 and 1987 American College of Rheumatology (ACR) criteria, respectively [2, 3]. The delayed treatment group (n = 109) received nonsteroidal anti-inflammatory drugs (NSAIDs) followed by the administration of standard DMARDs – chloroquine or salazopyrine – at a mean of 123 days after diagnosis. The early treatment group (n = 97) received NSAIDs with standard DMARDs at a mean of 15 days after the diagnosis (Fig. 1) . Results at 2 years indicated less radiographically evident joint destruction in the early-treatment group than in the delayed-treatment group (median Sharp scores: 3.5 versus 10; P < 0.05). Thus, even with non-biologic therapies, a delay in therapy resulted in poorer outcomes. Study of delayed and early treatment on disease outcome in patients with recent-onset rheumatoid arthritis (RA). *P < 0.05 compared with the delayed-treatment group. Adapted, with permission, from Excerpta Medica . The advantages of the early initiation of therapy combined with the introduction of newer antirheumatic agents (such as the TNF biologic response modifiers) have shifted treatment models toward the earlier and more timely use of DMARDs  and biologic therapy [5, 6]. A panel of rheumatic disease experts has issued a consensus report addressing the role of TNF antagonists in patients with RA; the panel stated that TNF antagonists may become first-line agents in the treatment of RA and should not be reserved for patients with advanced disease . A study by Wolfe investigated the relationship between HAQ disability scores and the clinical course of RA in 1843 patients . Analysis of 1-year, 2-year, and 3-year data from this study indicates that HAQ disability scores might increase gradually with significant increases in structural damage, as assessed by Larsen index scores (data on file, Centocor, Inc., Malvern, PA, USA) (Table 1). SJC, swollen joint count (maximum score 44); TJC, tender joint count (maximum score 53). Data on file, Centocor, Inc., Malvern, PA, USA. There might also be a discrepancy between disease course and the presence of clinical indicators of disease such as pain, swollen joint count, and tender joint count. Wolfe and Sharp compared clinical disease assessment and radiographic progression in 256 patients with RA who were seen within 2 years of disease onset and were followed for up to 19 years . On the basis of Sharp scores, joint-space narrowing, and erosion scores, it was concluded that RA progresses at a constant, linear rate that is neither greater in early RA nor reduced later in the course of disease (Fig. 2), and that other factors (such as mean erythrocyte sedimentation rate [ESR], mean grip strength, rheumatoid factor positivity, and swollen joint count) serve as independent predictors of radiographically evident joint destruction . Change in Sharp scores, joint-space narrowing (JSN), and joint erosion (JE) scores showing that rheumatoid arthritis progresses at a constant, linear rate. Adapted, with permission, from John Wiley & Sons, Inc. . The 2002 ACR Guidelines for the management of rheumatoid arthritis state that the ultimate goals of RA management are the prevention or control of joint damage, the prevention of loss of function, and the amelioration of pain . Kirwan described a potential pathogenic pathway for RA that supports these principles, showing a possible correlation between clinical symptoms and X-ray changes in RA (Fig. 3) . Potential pathogenic pathway for rheumatoid arthritis, supporting a relationship between structural damage and clinical symptoms. Adapted, with permission, from Excerpta Medica . As assessment of structural damage in RA is emerging as an important method of evaluating disease outcomes, radiographs (that is, X-rays), have become essential tools not just for the diagnosis of RA but for continued monitoring. Radiographic findings can be reported with the Sharp score or the Larsen index. 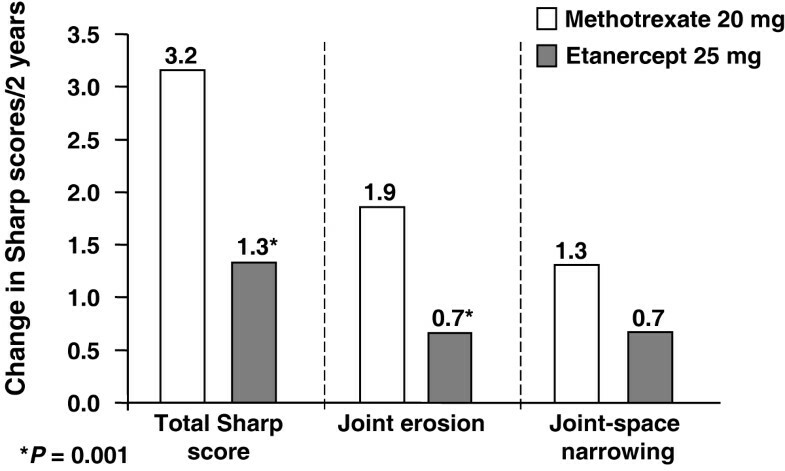 The total Sharp score is derived from the combination of erosion and joint-space narrowing scores. Joint-space narrowing is not a major contributor to the overall Larsen index score . Both Sharp and Larsen scores have been used to report outcome assessment data in clinical trials of TNF antagonists. The Anti-Tumor Necrosis Factor Trial in Rheumatoid Arthritis With Concomitant Therapy (ATTRACT) was a 2-year, double-blind, placebo-controlled study that showed that the TNF antagonist infliximab, in combination with methotrexate, was superior to methotrexate alone in improving the radiographic outcomes of patients with RA [11–13]. At the 52-week endpoint, the infliximab-treated patients showed improvements in erosion, joint-space narrowing, and Sharp scores (Fig. 4) . Data from the ATTRACT (Anti-Tumor Necrosis Factor Trial in Rheumatoid Arthritis With Concomitant Therapy) study showing the superiority of infliximab plus methotrexate (MTX) over methotrexate alone, as determined by the median change in the modified Sharp score. Data from . The Early Rheumatoid Arthritis (ERA) trial compared the efficacy of etanercept and methotrexate in 632 patients with early RA [14, 15]. This trial consisted of a 1-year blinded phase  and a 1-year open-label extension phase . Results at 2 years showed a significantly decreased incidence of structural joint disease in the etanercept-treated patients, as determined by changes in Sharp score (P = 0.001) and erosion score (P = 0.001); however, there was no statistically significant difference in joint-space narrowing scores (Fig. 5) . These two trials show how TNF antagonists have raised the standard of treating patients with RA on the basis of their shown ability to produce significant improvements in clinical parameters (such as ACR response) and to retard the radiographically assessed progression of joint damage. Data from the ERA (Early Rheumatoid Arthritis) trial showing the superiority of etanercept over methotrexate, as determined by improvements in erosion and Sharp scores, but not joint-space narrowing score at 2 years. Adapted, with permission, from John Wiley & Sons, Inc. . Although radiographic evidence of disease progression is frequently assessed by Sharp scores, clinical data are usually assessed by ACR criteria, such as the ACR20. Achievement of an ACR20 response indicates a greater than 20% improvement in tender and swollen joint counts and at least three of the following disease activity variables: the patient's assessment of pain, the patient's global assessment of disease activity, the physician's global assessment of disease activity, the patient's assessment of physical function, and the ESR or the C-reactive protein level [5, 16]. However, failure to achieve an ACR20 response should not necessarily be interpreted as a failure of therapy. 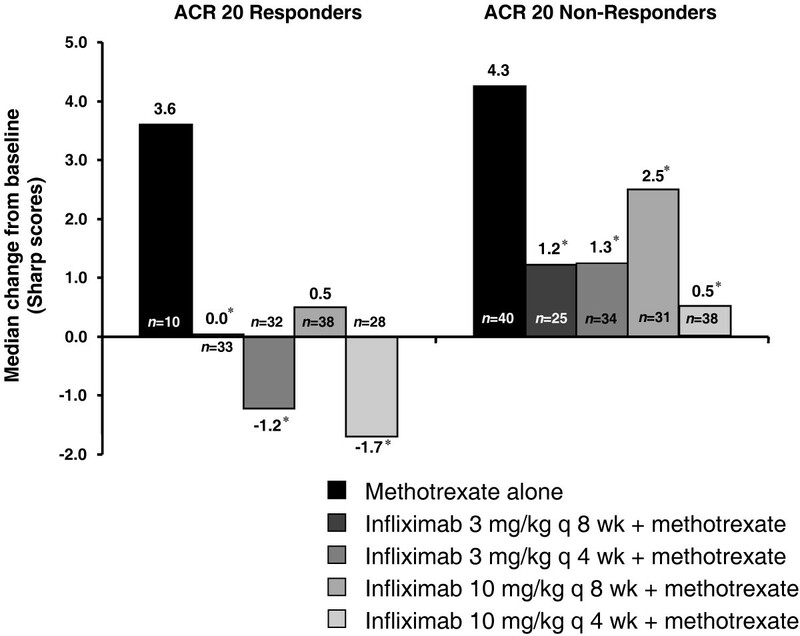 Preliminary subgroup analysis data from the ATTRACT study indicate that in patients who failed to achieve an ACR20 response (that is, non-responders), those treated with infliximab and methotrexate showed a greater improvement in ACR20 response than the patients treated with methotrexate alone (Fig. 6) (data on file, Centocor, Inc.). Thus, the regular use of radiographic imaging, including X-rays, can be considered an important component of the overall assessment and evaluation of patients with RA. Preliminary radiographic data from the ATTRACT (Anti-Tumor Necrosis Factor Trial in Rheumatoid Arthritis With Concomitant Therapy) study, indicating the superiority of infliximab plus methotrexate over methotrexate alone in patients who did and did not achieve an ACR20 (that is, ACR20 responders and non-responders). ACR20 is a more than 20% improvement in tender and swollen joint counts and at least three of the following disease activity variables: the patient's assessment of pain, the patient's global assessment of disease activity, the physician's global assessment of disease activity, the patient's assessment of physical function, and the erythrocyte sedimentation rate or C-reactive protein level. *P < 0.05 versus placebo. Data on file, Centocor, Inc., Malvern, PA, USA. The failure of a patient to respond to a single TNF antagonist should not be taken to mean that the patient is refractory to all TNF antagonists. Studies have shown success with infliximab in patients who have failed to respond to etanercept therapy, and vice versa. In one study, investigators in community rheumatology practices documented the efficacy and safety of infliximab in patients with an inadequate response to etanercept . After four infusions of infliximab, patients experienced reductions in mean tender joint counts (57%), mean swollen joint counts (66%), ESR (20%), and mean daily prednisone requirement (38%) (Table 2) . Although this study lacks the structure of a randomized controlled clinical trial, it provides preliminary data that TNF antagonist therapy should not be abandoned in the face of an apparent initial unsatisfactory response. ESR, erythrocyte sedimentation rate. Data from . Discontinuation rates of a pharmacologic agent, including antirheumatic agents, can influence therapy. Discontinuation rates can serve as a reasonable guide to the efficacy or safety of an agent. Before definitive conclusions can be made, other variables should be considered, for example the phase of therapy (such as acute, continuation, maintenance), reasons for the discontinuation (such as lack of efficacy, toxicity, adverse events [AEs]), associated symptoms or intercurrent illness, and drug profile (including previous medications and concomitant therapy). Discontinuation rates can also serve as a reflection of the chronic, aggressive course of the disease, which can require more than one therapy or can sometimes involve the switching of agents to achieve satisfactory clinical outcomes. For a better understanding of how discontinuation rates affect therapy in the era of anti-TNF agents, a review of the discontinuation rates with DMARDs based on three large studies is presented [18–20]. According to a Markov model based on the Arthritis, Rheumatism, and Aging Medical Information System (ARAMIS) postmarketing surveillance cohort (n = 4285 consecutively enrolled patients with RA who were followed up for 17,085 patient-years), 46–60% of patients initially receiving methotrexate alone would still be on methotrexate alone or with a DMARD after 5 years . When patterns of drug use in patients with RA in a community setting were evaluated, drug discontinuation and medication switching were observed to be common . Almost 20% (1300 of 6944) of patients who took at least one antirheumatic drug during the study year used a DMARD, with methotrexate being the most frequently used. Of the DMARD users, 23% discontinued the drug during the study year, 19% were taking other concurrent DMARDs, and 16% added another DMARD. DMARDs were often used with other (that is, non-DMARD) agents, because 63% of DMARD users were also taking an NSAID and 61% were taking a corticosteroid . 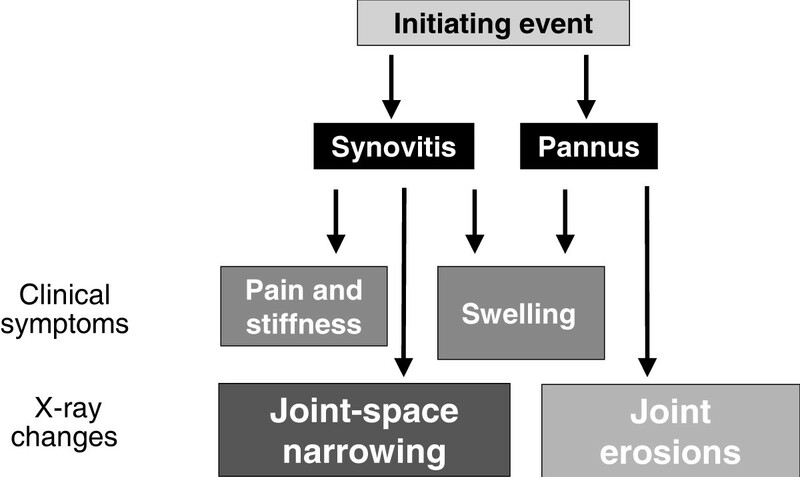 Aletaha and Smolen  evaluated the treatment patterns with traditional DMARDs and their changes during the two decades before the introduction of newer antirheumatic agents. The study involved 593 patients with RA who were followed from their first presentation in the clinic throughout the course of their disease, of whom 222 patients received their first DMARD during the study . Before 1985 most (65–90%) of initial DMARDs were gold compounds, whereas after 1985 methotrexate was the initial DMARD in 29% of new patients. Patients with high disease activity were more likely to be receiving methotrexate than other DMARDs, and first DMARDs in new patients were used for longer than subsequent DMARDs, because they were more effective . On the basis of an analysis of 122 controlled trials and observational studies involving 16,071 patients with RA, Hawley and Wolfe  concluded that good retention rates in studies lasting 3–12 months were not representative of long-term results, although the retention rates observed in controlled and observational studies were similar during the first treatment year. Discontinuation rates for anti-TNF agents as observed in two long-term, randomized RA trials, one involving infliximab (ATTRACT) and the other etanercept (ERA), are listed in Table 3 [12, 14]. These trials differed in terms of study size (428 versus 632 patients), stage of RA (later-stage [active] versus early), and regimens (anti-TNF therapy plus a DMARD compared with placebo plus a DMARD [ATTRACT], versus anti-TNF monotherapy compared with a DMARD [ERA]). In the ATTRACT study, in which patients were randomized to receive 3 or 10 mg of infliximab every 4 or 8 weeks, or placebo, with methotrexate given to all groups, 54-week data showed that discontinuation rates due to AEs were about 8% (26 of 340) in infliximab-treated patients compared with about 16% (7 of 44) of patients in the placebo-plus-methotrexate group . The discontinuation rates due to lack of efficacy were about 12% (40 of 340) in the infliximab-treated patients compared with about 73% (32 of 44) in the placebo-plus-methotrexate group. In the ERA trial, in which patients were randomized to receive 10 or 25 mg of etanercept twice weekly, or methotrexate weekly, discontinuation rates due to AEs or elevated aminotransferase levels were 6% for the group receiving 10 mg of etanercept, 5% for the group receiving 25 mg of etanercept (P < 0.001 versus methotrexate), and 11% for the methotrexate group . Lack of efficacy was the reason for discontinuation in 7% and 5% of patients in the groups receiving 10 and 25 mg of etanercept, respectively, versus 4% in the methotrexate group . aAll groups also received methotrexate, mean 16–17 mg/week. ATTRACT, Anti-Tumor Necrosis Factor Trial in Rheumatoid Arthritis With Concomitant Therapy; ERA, Early Rheumatoid Arthritis. The chronic course of RA merits long-term maintenance therapy. Efforts to lower discontinuation rates have included the administration of methotrexate together with anti-TNF agents. Support for enhanced therapeutic efficacy with this approach has been documented [22, 23]. 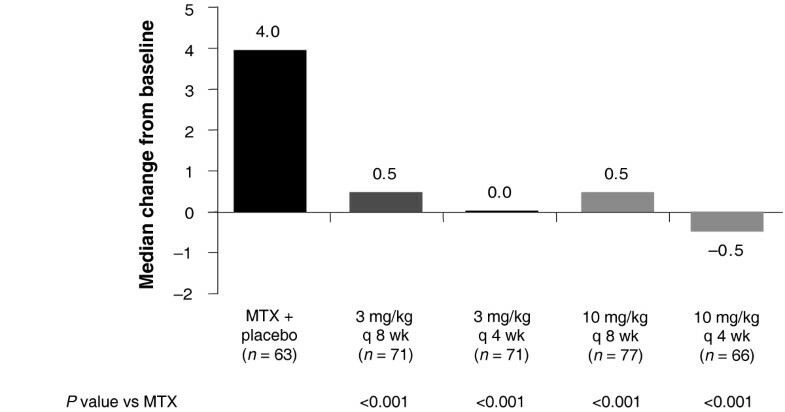 Maini and colleagues conducted a 26-week, double-blind, placebo-controlled trial in 101 patients with active RA exhibiting an incomplete response to methotrexate(about 9–15 mg per week for the last 3 months before the study) . Patients received either infliximab 1, 3, or 10 mg/kg intravenously with or without methotrexate 7.5 mg per week, or placebo plus methotrexate 7.5 mg per week intravenously at weeks 0, 2, 6, 10, and 14; follow-up continued until week 26 . Results showed that when infliximab (at all dose regimens in the study) was administered together with infliximab and weekly methotrexate, 60–80% of patients attained a Paulus 20% response for up to 14 weeks, and 50–60% of patients sustained a response after the cessation of treatment until the end of the study . In the ATTRACT study, the combination of infliximab and methotrexate over 30, 54, and 102 weeks provided significant, clinically relevant improvement in a majority of patients with RA who had an incomplete response to methotrexate alone; however, discontinuation rate data at 102 weeks have yet to be made available [11–13]. As more data from long-term trials that involve these agents accumulate, focusing on discontinuation rates and correlating safety and efficacy parameters, the role of concomitant methotrexate in the long-term maintenance of anti-TNF therapy will be clarified further. Aside from clinical trial data, clinical practice data report the discontinuation rates of anti-TNF agents. A 2-year Swedish study conducted in seven clinical centers evaluated the anti-TNF agents infliximab (n = 135) and etanercept (n = 166]) and a newer-generation DMARD, leflunomide (n = 103), for efficacy (based on ACR response criteria) and tolerability (based on survival and AEs) in patients with RA . Initial doses of the agents in this study were 3 mg/kg intravenously at weeks 0, 2, 6, and 12 and every 8 weeks thereafter for infliximab, and 25 mg subcutaneously twice weekly for etanercept; appropriate dose adjustments and switching to another of the three agents were allowed after withdrawal from one treatment . On the basis of ACR20 and ACR50 responses, the TNF antagonists performed significantly better than the newer DMARD, and no significant differences were noted between the efficacy of infliximab and etanercept at 0.5, 1.5, 9, and 12 months . 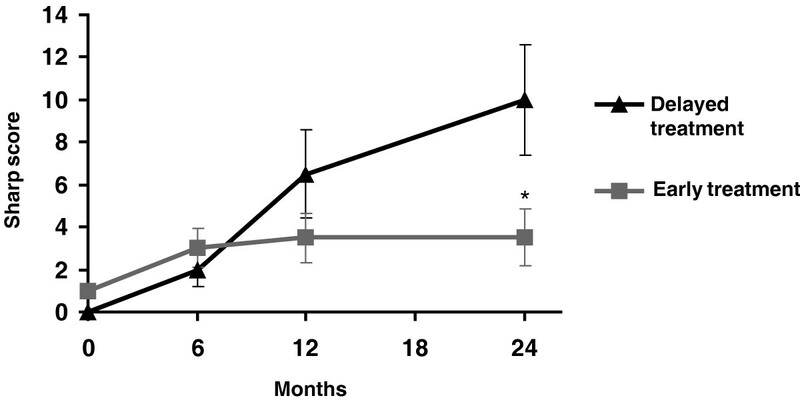 At 3 months, ACR20 and ACR50 responses were noted in a greater percentage of patients who received infliximab than leflunomide (P < 0.01 and P < 0.05, respectively), whereas ACR20 and ACR50 responses were noted in a greater percentage of etanercept-treated and leflunomide-treated patients at 3 months (P < 0.001) and 6 months (P < 0.05) . Survival data showed that 75%, 79%, and 22% of patients continued to receive infliximab, etanercept, and leflunomide, respectively, after 20 months (for 24-month discontinuation rates of 25%, 21%, and 78%, respectively) . In the infliximab-treated and etanercept-treated patients in this study, AEs were the primary cause of drug discontinuation. There were 2.8 life-threatening AEs per 100 treatment-years (namely anaphylactoid reaction, mesothelioma, and severe pharyngitis) and 10.0 serious AEs per 100 treatment-years (namely allergic reactions, bacterial infections, Hodgkin's/non-Hodgkin's lymphoma, thrombocytopenia, lupus-like reaction, discoid lupus) with infliximab. Etanercept-treated patients experienced 1.3 fatal AEs per 100 treatment-years (namely gas-troenteritis, immunocytoma of the breast, and myocardial infarction) and 7.0 serious AEs per 100 treatment-years (namely myocardial infarction, bacterial infections, uterine cervical carcinoma, leukemia, malaise, leucopenia, Bell's paralysis, cutaneous vasculitis, discoid lupus) . An electronic medical record system was used to review all patients seen in a university rheumatology clinic (the Arizona Arthritis Center at the University of Arizona) who had been treated with infliximab (n = 118) or etanercept (n = 90) between February 1998 and May 2002 . Data were collected on diagnosis, disease duration, dates of therapy, reasons for treatment discontinuation, and AEs and serious AEs. Most (82%) of the 208 patients in this study had a diagnosis of RA . Kaplan-Meier analysis for the discontinuation of any anti-TNF therapy showed a mean medication duration of 768 days (95% confidence interval [CI] 693–843 days) with a maximum follow-up time of 1260 days . For infliximab, the mean time to discontinuation was 931 days (95% CI 844–1018 days), with 32 (27%) of 118 patients discontinuing infliximab. After 15 months there was a 0% rate of discontinuation with infliximab . For etanercept, the mean time to discontinuation was 595 days (95% CI 491–700 days), with 58 (64%) of 90 patients discontinuing etanercept . The log-rank test coefficient for the difference between survival curves for the two groups was 20.03 (P < 0.01) and the Gehan-Breslow coefficient was 16.01 (P < 0.001) . The investigators documented a low probability of discontinuations of infliximab after 1 year of treatment and concluded that, on the basis of the results of the survival analysis of the data from their practice, patients receiving infliximab remain on therapy significantly longer than those on etanercept . Clinical trials and community findings support the efficacy and safety of the current TNF antagonists. To optimize comprehensive therapeutic outcomes in clinical practice, DMARDs or anti-TNF agents, or both, should be instituted early, and patient status and response to therapy should be monitored on a regular basis by using X-rays and radiographic scores. Structure-related parameters are emerging as a most important measure of outcome by which the efficacy of antirheumatic therapies are evaluated. In addition to a reduction of symptoms and improvement in physical function, optimal reductions in erosions and joint-space narrowing should be part of the goals of therapy. Patients who show an unsatisfactory response to one anti-TNF agent should be started on another. Adherence to therapy is an important element in optimizing outcomes, and durability of therapy can also be achieved in the clinical setting. Finally, the concomitant administration of methotrexate might be important in the maintenance of TNF antagonist therapy in the long term. Overall, the TNF antagonists have provided significant improvements in clinical and radiographic outcomes for patients with RA, especially those who have had an incomplete response to methotrexate therapy. DY is, or has been, a speaker for Centocor, Boehringer-Ingelheim and Amgen, is a consultant for Centocor, Novartis and Boehringer-Ingelheim, and has received grants from Centocor, Amgen, Abbott, Medimmune, Alexion and Novartis.